I’m pretty lax when it comes to a lot of things in life, but when it comes to safety in our home, I’m a wee bit obsessive. With two little ones running around and both my husband and I working from home, we spend a majority of our days in our home. As a parent, we take home safety seriously and strive to make our home a a healthy, safe space for everyone. When it comes to home safety, there are severals areas in which cause the most concern: intruders, theft, fire, flood, weather and accidents. 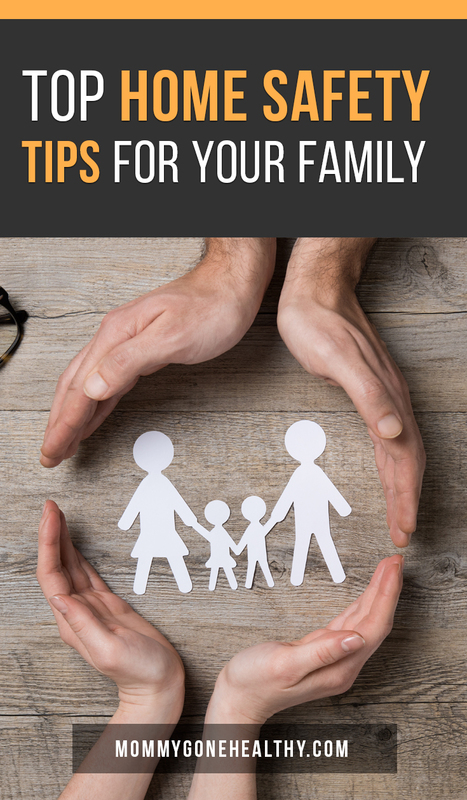 Creating a safe environment and home where your family can thrive and grow can be obtained easily with a little planning. Below are some simple tips that can help ensure that your home is a safe place for your family and friends. Install a Home Security System: A home security system is your first line of defense against intruders or theft. 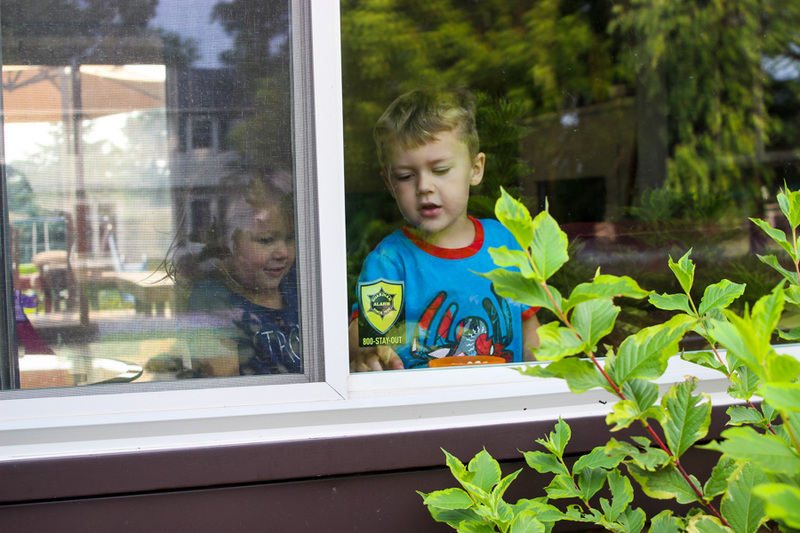 We have a home security system with Guardian Alarm and it gives us peace of mind when it comes to protection our family and home. With a push of a button (or through using our app), our security system is activated and ready to alert (and get help) if there is an issue. Motion sensor detectors on our doors and windows can trigger the alarm and a camera allows us to easily see who comes to our door. We’ve had our system for a few months now and it’s provided our family/home with an additional net of safety, especially with all the summer travel that we’ve been doing. Having the camera installed has been great for checking in our home when we are gone for long periods (or to take a peek to see what’s going on when the kids are with a sitter). It can pan the room to allow us to view multiple areas with a push of button in the app. Lock Windows & Close Garage: Open windows and open garages are the easiest ways for someone to easily enter your home. Keeping your garage door closed prevents easy entry into your home and doesn’t allow others to see valuables that you have in your garage. 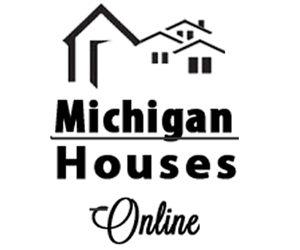 Lock windows when not in use and not at home. I love having motion sensors with Guardian Alarm on our windows/doors (especially those in our basement) to be sure that no one can open or bust a window to unknowingly enter our home. Install a Deadbolt: A deadbolt is so much stronger than a regular door and key combo. We installed a Keypad Deadbolt with Guardian Alarm for ease of use and additional protection. The keyless entry is amazing when you have your hands full (such as carrying 20 groceries bags or wrangling the kids). Home Automation: If you know you will be gone for a long period of time, turning on lights in the evening is a great way to make it appear as if they home is occupied. 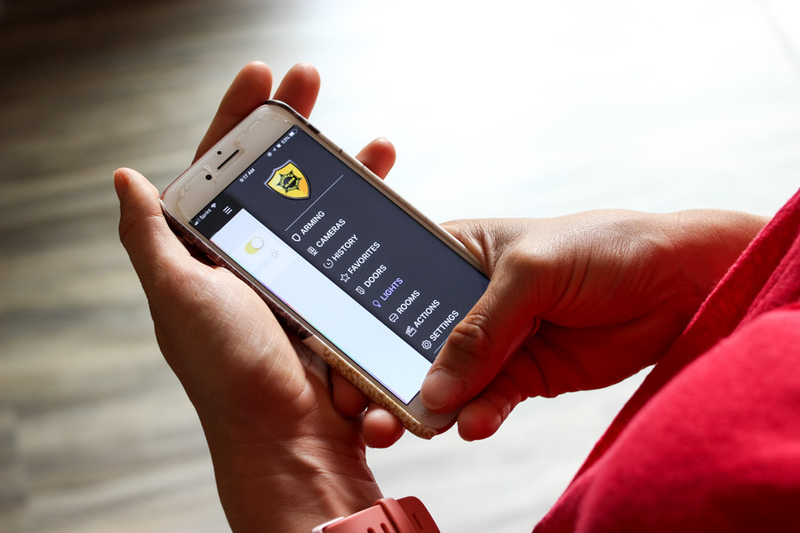 With our Guardian Alarm service and app, we can automatically turn lights on/off through the app when not home. It’s great for vacationing or to prevent having to walk into a dark home. Smoke Detectors: Install smoke detectors on every floor of your home. Remember to change batteries annually. Changing batteries at the change of seasons is a simple way to be sure that you have new and working batteries installed. Carbon Monoxide: Every year 20,000 to 30,00 people are sickened by carbon monoxide poisoning and nearly 500 people die. Carbon monoxide is impossibly to detect via smell or sight, so installing carbon monoxide detectors on each floor is a must. When we had our security system installed, Guardian Alarm installed a carbon monoxide detector near our furnace (most common area in which you have carbon monoxide leaks) and it’s great because it immediately notifies with a pulsing alarm if carbon monoxide is detected, as well as notifying their monitoring and dispatch centers. 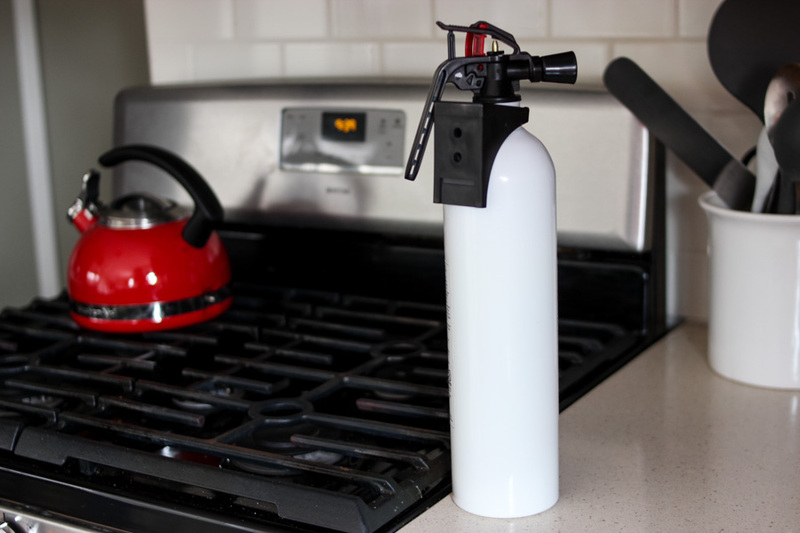 Fire Extinguisher: Having at least one fire extinguisher in your home is a must! It’s best to keep it located near the kitchen or fireplace. Don’t forget to check to make sure it hasn’t expired. Prevention: When using candles, be sure that they are not near loose fabric (like curtains) and on surfaces that can withstand heat. Keep out of reach of children and animals. When not using small appliances (like toasters/coffee makers), unplug them. Leak Detector Alarm: A sump pump or leak detection alarm can be a lifesaver and prevent so much headache in the case of a sump pump malfunction. Speaking from experience (our sump pump stopped working on our first home), it takes very little time for water damage to occur. You can purchase sump pump detectors and Guardian Alarm offers a leak protection alarm that not has a loud alarm in case of a water leak (busted pipes, washing machines, sump pups, etc.) but also connects to their home monitoring and dispatch center to alert you, even when you aren’t home. Weather Radio: A weather radio is a must for times of inclement weather. You can pre-program them to only receive alerts for dangerous weather in your area. In the case of dangerous weather, a weather radio can be one of the best ways to stay informed and safe. Charger Bank: We always keep one of these on hand and charged. If we lose power, we are able to at least keep our phones charged to use in case of an emergency. Non-Perishables: It’s always a great idea to keep at least a few days worth of non-perishables and bottle water in your home. If you’re unable to leave your home or others can’t reach you (i.e. downed wires, ice storms), you want to be prepared to stay put for a few days. Prevent Falls (#1 cause of injury/death): Clear clutter off floors, keep walkways lighted and for those with children, install gates at the top and bottom of stairs. Prevent Poisoning: Keep all poisonous chemicals, medicine and cleaning supplies up high and out of reach of curious children. If possible, keeping in a locked cabinet is best. Dispose of old and unused medications. Keep Poison Control Center number posted – (800) 222-1222 – for quick access in case of poisoning. 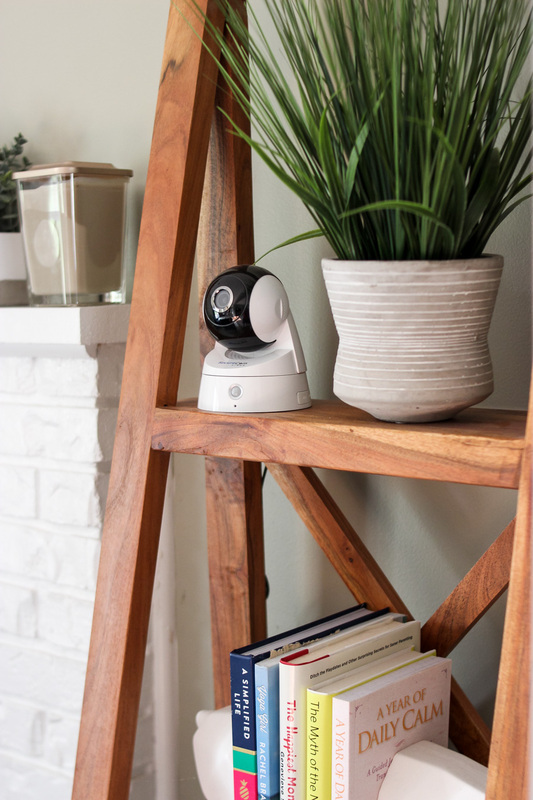 For those that want a little extra help or assurance in making sure that their home is safe and secure, a home security system is a great option. 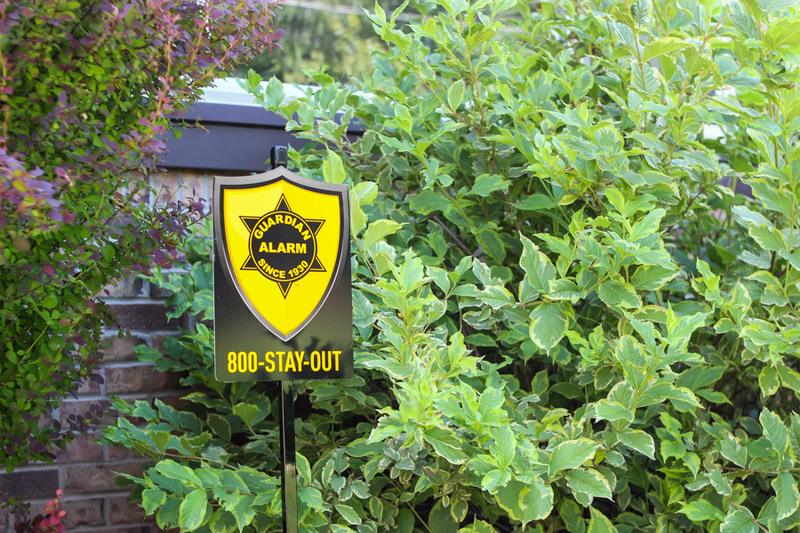 We have an alarm system with Guardian Alarm and love the peace of mind that it brings. With Guardian Alarm, you not only have protection from intruders or theft, but also have protection from fire, carbon monoxide and flooding. We’ve had our system for a few months now and installation was a breeze (you can read more about that here). For more information on installing a security system and your option with Guardian Alarm, click here. For more unexpected reasons to get a security system, check out my other post here. This is very good advice. We had a fire extinguisher that we’ve had for a little while. When we were having our home inspection (foster parents) they informed us that our Kitchen fire extinguisher was recalled. I’m so glad that they told us. I would never of known. A flood detector would be awesome. My friend came home a few weeks ago to water damage that had been getting worse the whole time she was on vacation. Whenever we are away, we usually have someone stay at our home. I like the idea of having the Guardian Alarm service! And yes, it is also essential to unplug everything to be safe.